After reading the benefits of using SMS functionality in Joomla you are prepared for adopting the Ozeki SMS Newsletter solution. 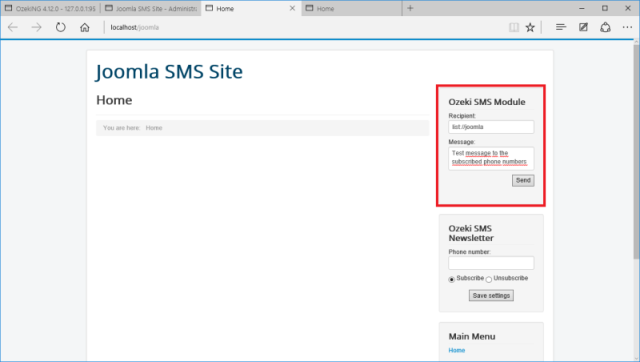 This configuration guide will instruct you how to build up your own "Ozeki SMS Newsletter" module with Ozeki NG SMS Gateway to start SMS newsletter service on your website. Read more to learn about the SMS Newsletter solution. Please visit Internet based SMS connections vs. GSM modem based (wireless) SMS connections page to select the suitable network connection for SMS sending. 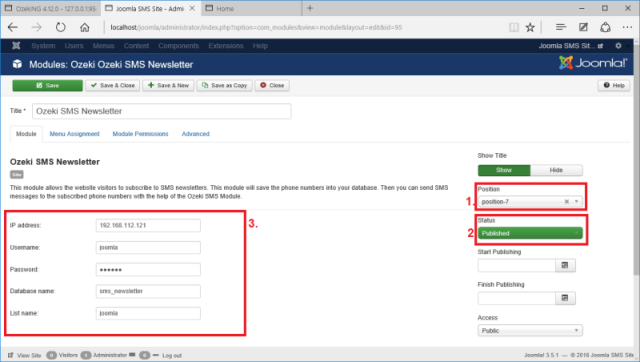 To subscribe for SMS Newsletter,the users have to fill in the subscription form on a Joomla website and select the "Subscribe" option on it. By clicking on the "Save settings" button the phone number will be subscribed to the SMS newsletter service. From this time on, the users can subscribe for newsletters in SMS. 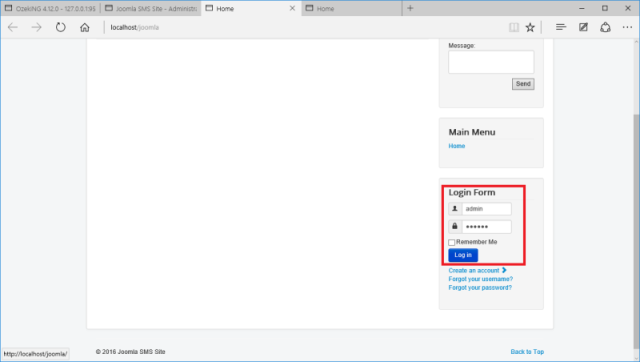 If the administrator (or a user who is super user) logs into the website, he will be able to send out SMS newsletter from the front-end website with Ozeki SMS Module through Ozeki NG SMS Gateway. The sending process is shown in Figure 1. 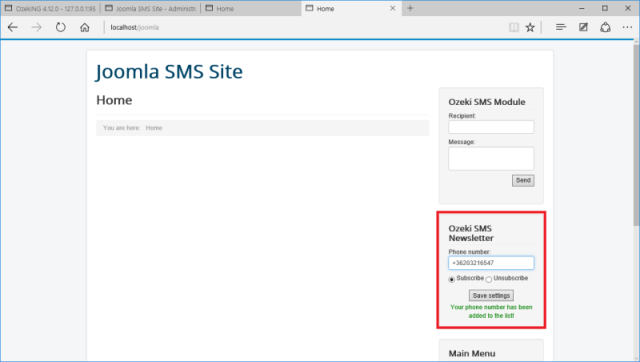 To be able to send SMS Newsletters from Joomla with Ozeki SMS Newsletter module please follow the installation steps in this guide and watch the video tutorial for help. In this part of the installation, we will create a new database that will be responsible for storing the lists of the list management function of Ozeki NG SMS gateway. If the database will be ready, we will connect Ozeki NG SMS Gateway to the same database. Now login to the configuration page of your Ozeki NG SMS Gateway sofware, and navigate to Edit \ Server preferences \ Databases \ List manager settings. 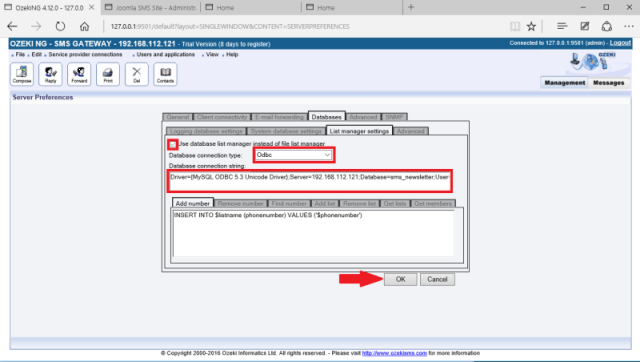 Select Odbc method and provide a connection string for connecting to the database. Modify the server address, database name, username and password values (Figure 2). 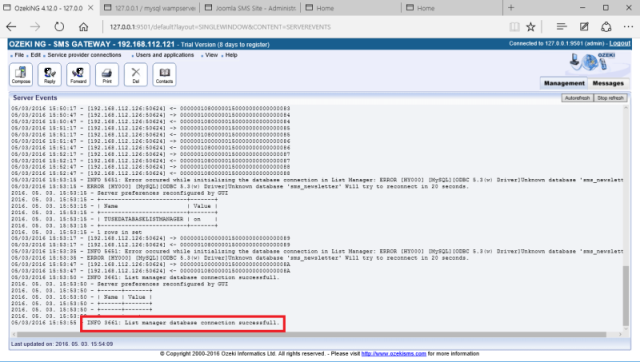 Under View \ Server events menu, you can check whether the connection has been built successfully or not (Figure 3). Now, create a new list in order to be able to store the phone numbers. Go to Edit \ List management menu, and click on Add new list... button (Figure 4). On the next page a textbox appears on the right side of the webpage. Provide a name for the list, and click on Ok button (Figure 5). 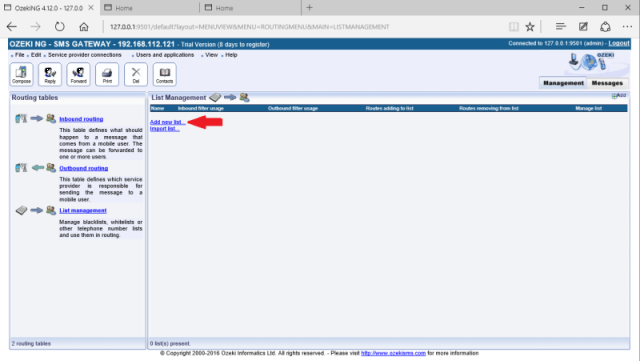 After you have create the list in Ozeki NG SMS gateway, open the administratuon page of your Joomla website. 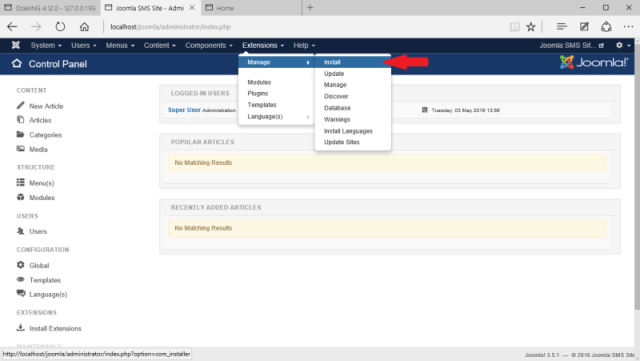 Click on Extensions \ Manage \ Install button to install Ozeki SMS Newsletter module (Figure 6). Then click on Choose file button, and load the previously downloaded mod_ozekismsnewsletter module file (Figure 7). 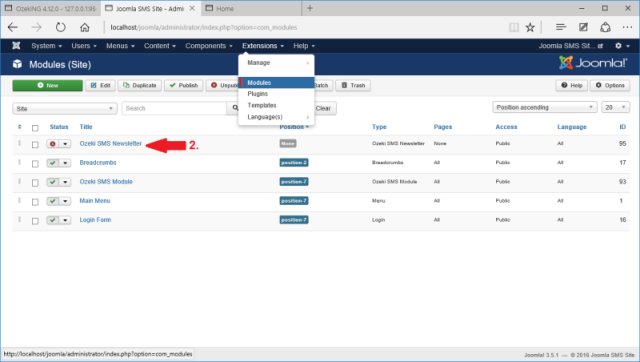 Go to the installed modules page of the administration panel and click on the name of the newly installed module (Figure 8). 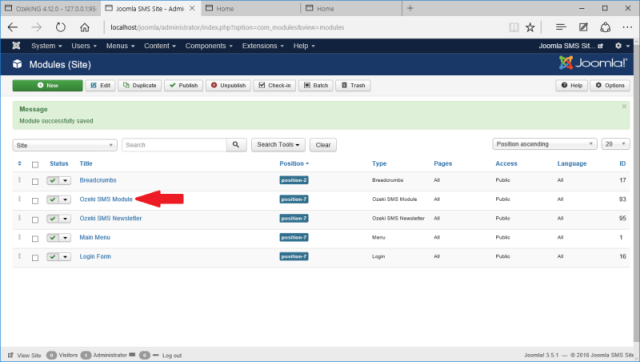 On the right side of the Module tab, select a position where you would like to display the module and modify the status to Published. On the left side of the Module tab, you need to give the data of your MySQL server and database in which the lists are stored (Figure 9). 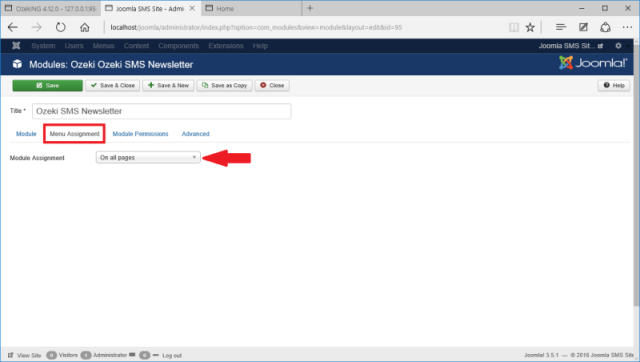 Under the Menu assignment tab, you need to select the pages where the Ozeki SMS Newsletter module should be displayed (Figure 10). 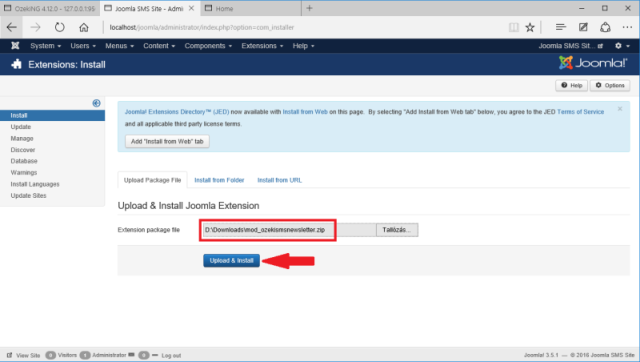 At the end of the configuration, click on Save button, and open the main page of the Joomla website. You can see the installed module on the right side of the website (Figure 11). SMS messages can be sent to the subscribed phone numbers with the Ozeki SMS Module. By default, every user can send SMS messages with the Ozeki SMS Module, so in the following part of this guide, I will show you how to give permission only for super users. After you have installed the module successfully based on the installation guide of the Ozeki SMS Module, go to the configuration page of the Ozeki SMS Module (Figure 12). 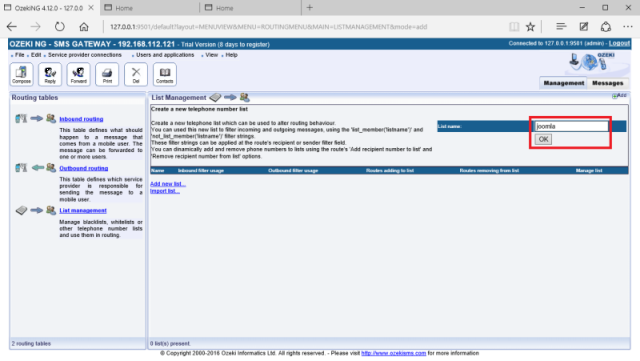 On the right side of the configuration page, select Super Users from the drop down menu that belongs to the Access label. Then click on Save button (Figure 13). 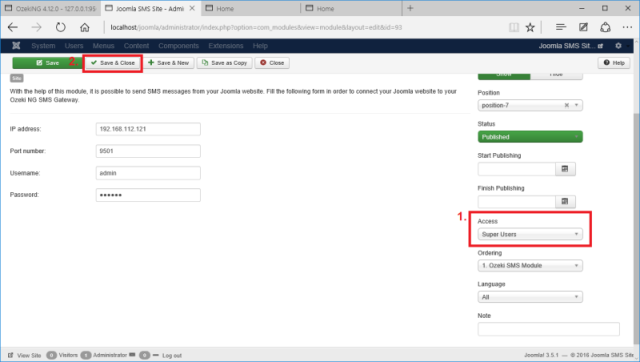 If you open the main page of your Joomla site, login as a super user (such as admin) and the Ozeki SMS Module will be displayed on the selected position (Figure 14). Provide the name of the list in the following format, and the SMS messages will be sent to the phone numbers that can be found in the list (Figure 15). As you have seen, SMS Newsletter module are very simple to configure and use. This guide provided all the necessary information, instructions to start operating your own SMS Newsletter feature in Joomla. This solution is suitable for marketing and advertising processes as well as keeping contact with customers. Thank you for your attention.